Weekly Roundup 2-9-15 – Peninsula Moves! Presidents Day Service Changes: Presidents Day will be celebrated on February 16, meaning that Monday will feature service and scheduling changes from the Bay Area’s public transportation providers. 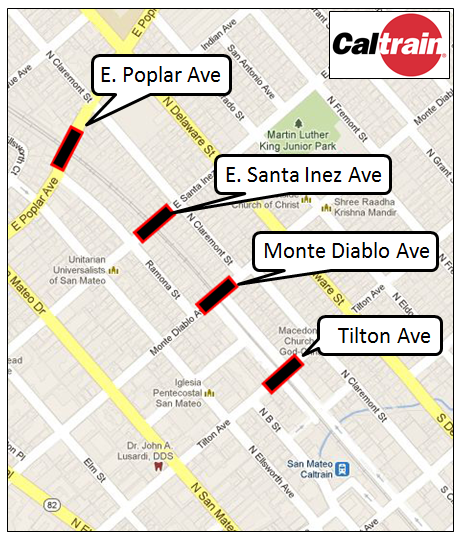 Caltrain will operate on a modified schedule, while SamTrans will run a regular, non-school day schedule on Monday. BART and Muni will operate on a Saturday schedule, Golden Gate Transit will run a Holiday schedule, meaning there will be no commute buses or ferries, and AC Transit will serve a Sunday schedule. A full list of the service changes for Monday can be found at the Transit 511 website here. Celebrate Valentine’s Day, Bay Area Style: Bay Area residents who might be a touch cynical about the various clichés and romantic tropes surrounding Valentine’s Day will be able to take out their aggression (in a loving way) by participating in the annual Pillow Fight contest staged at Justin Herman Plaza in San Francisco. Held every Valentine’s Day, the event usually features more than 1,000 attendees, who playfully smack around each other with feather-filled pillows. This year’s gathering is tentatively scheduled for dusk on Saturday, and is perfect for anyone sick of watching romantic comedies. For those wary of catching a pillow to the face, the Pillow Fight also makes for a great spectator sport. Located near the Ferry Building in downtown San Francisco, Justin Herman Plaza is a short walk from various Muni and BART stops.